At the OAS AGM in 2016 a resolution was passed which instructed the Committee to take steps to become a Scottish Charity Incorporated Organisation (SCIO). The point of doing this was to provide the Committee and the organisation with the benefits of incorporation and was felt to be especially useful for a number of reasons, including limiting the liability of the charity trustees, making OAS a legal personality that can undertake transactions in its own right and giving OAS the freedom to take all steps and actions in pursuit of its charitable objects (subject to any specific restriction in the constitution). SCIO’s continue to be regulated by the Office of the Scottish Charity Regulator (OSCR). What does this mean for me as a member or as a supporter? In practice there is no change to the daily business of the Society, we have the same aims and objectives and the majority of Committee members are continuing, but will now be known as Trustees. To celebrate the start of OAS as a SCIO we have updated our logo. We gave the designers a general brief of wanting a logo which represented Orkney and Archaeology, without having a focus on any specific excavation given that we have a remit across Orkney as a whole rather than any individual project, and we also wanted to have our name in full as part of the logo, simply to avoid confusion with the other OAS’s in Orkney, such as the Orkney Art Society and the Orkney Agricultural Society. So, thanks to the hard work of the lovely folk at iDesign in Quoyloo, we are the proud owners of a logo that we hope will become an easy way of spotting, across Orkney and beyond, projects that this Society has been involved with, and supported. We think the combination of the colours (green, blue and purple),the Stones and a trowel are eyecatching and a simple way of representing who we are and what we stand for. 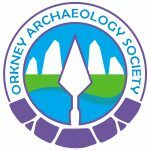 Watch out for merchandise with the new logo over the summer, which we will also be selling from our website and, as always, all profits are put towards supporting, protecting and promoting archaeology in Orkney. The Society is run according to our Constitution by our management committee.